Let New York Sealcoating breathe new life into your surface deteriorated pavements with our efficient and preventative seal coating services. Count on our paving contractors to keep your pavements and parking lots well maintained. We use a environmentally friendly water-based, Petroleum Resin Sealer which is a coal tar alternative that outperforms traditional pavement sealers. We are the pioneers in Eco-Friendly Sealer which means No Oder and Less Chemicals! While properly designed parking lots rarely wear out from traffic, damage is usually caused by the weathering effects of the sun and rain, as well as from the softening effects of de-icers and gasoline and oil drippings. Along with water accumulation, oxidation can cause major pavement damage through raveling from the surface, leading to harmful cracks. Whether you need help with asphalt paving or masonry work, we’ve got you covered. Let us establish a preventive maintenance program before these damaging elements take over your pavement. Application of a rubber-fortified coal tar emulsion is the most cost-effective pavement maintenance in Yorktown Heights, NY, that’s available. Double your asphalt's life by letting a seal coat protect it from destructive forces. In addition to its practicality, seal coating also enhances the appearance of your pavement by giving it an attractive and easy-to-clean black finish. Silica sand is usually added to coal tar sealers to provide a heavier wearing surface. The addition of sand also means that the sealer lasts longer and is more skid resistant. to create tough and long lasting protection. Blocks out the damaging effects of the sun. jet fuel leaks and spills. A low VOC, non-flammable coating that contains NO coal tar to irritate skin. A tight seal forms an impenetrable barrier to protect against the destructive effects of sun, water and chemicals, giving pavement a jet black color. Engineered to perform at temperatures as low as 40°F. 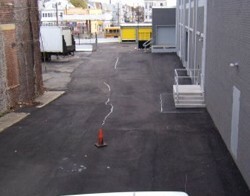 our pavement maintenance services, and let us seal coat your parking lot today.